Gluten-Free Cookies Can Be Delicious! First, I should ask my babysitter to write this post instead of taking credit for it, but since she's away at camp this week, I will do the honor. My older son is following a diet free of dairy, gluten and soy. This is my super active, super skinny, super tall son who loves sweets. Fortunately, he also loves fruits and vegetables and doesn't seem to mind this diet at all. In fact, he loves to tell me something has gluten in it just so he doesn't have to eat it. Clever little beast. But I digress. My cookie monster will eat boxes of cookies a day if we let him. Not only is this a lot of empty calories (again, not entirely an issue; he eats a lot of healthy stuff, too), but the cost of these cookies is pretty notable. The best brand for his particular diet is Enjoy Life. They have a nice selection of soft and hard cookies that taste good but a box is anywhere from $4-$5. For 12 cookies. That gets my value hackles up and also I really don't like to rely on processed treats. I mean, I buy granola bars and whatnot because I don't have time to make everything from scratch, but I don't like it. Enter the babysitter. I buy gluten-free baking mix and dairy/soy/gluten-free chocolate chips and ask her to bake cookies with the boys. They love to be helpers. She texts me the first day: "What do I use instead of butter?" Legitimate question. I run through my pantry in my mind and come up with coconut oil, applesauce and ghee. To Google I go. I don't find anything conclusive but tell her to try an equal substitution with half coconut oil and half applesauce. Those were the best chocolate chip cookies ever! Soft and flavorful. Not buttery but not bland and not coconutty either. Since that first batch, we have experimented with different mixes. 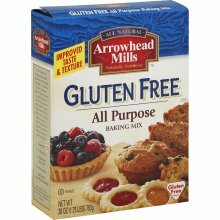 It's hard to buy just the all-purpose gluten-free flour because then you have to find xanthum gum and baking powder/soda (I never remember which) and it's just more complicated than having a "baking mix." The Arrowhead Mills mix pictured here works well. Not inexpensive, though. 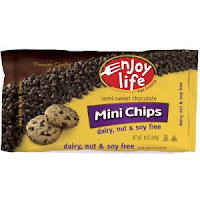 We use the Enjoy Life chocolate chips, because they are soy-free and that's hard to find. I'm going to suggest that she try the next batch with half or all ghee to see if that delicious butter flavor will be worth the cost increase. Speaking of which, if I add up the ingredients, it's probably close to breakeven with the store-bought cookies, maybe a little less. But they are homemade and there is less waste—and the boys get baking lessons to boot.